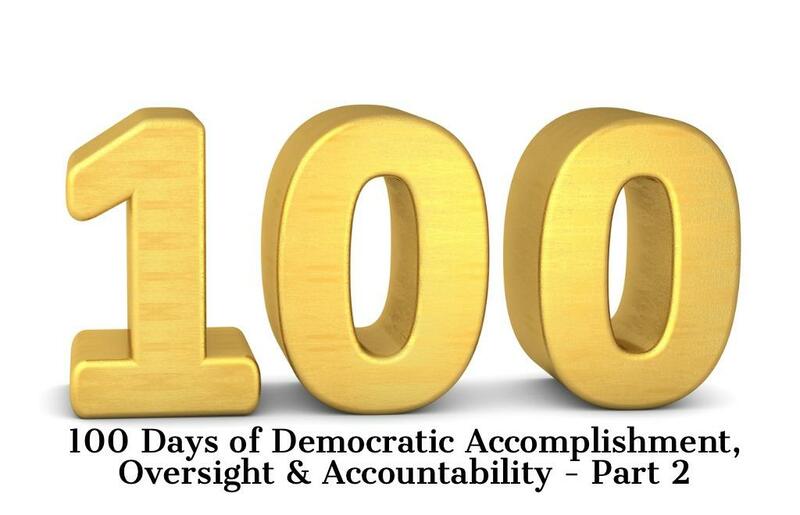 As House Democrats approach their 100th day in the majority on April 13, Future Majority is taking a look at what they’ve achieved in a short period of time and in the face of constant GOP obstruction and rampant chaos and corruption emanating from the Trump White House. As Trump and the GOP worked to tear down the Affordable Care Act -- work that continues to this day -- harmed millions of people with a costly, unnecessary and unprecedented 35-day government shutdown, and concealed the fact that the president wrote hush money checks to an adult film actress while sitting in the Oval Office, Democrats governed. Democrats passed a resolution condemning Trump administration attacks on the Affordable Care Act and the millions of Americans who have benefitted from it. Trump wants to eliminate health care for more than 20 million Americans and jeopardize the health care of tens of millions more with pre-existing conditions. Democrats fought back - and will continue to - as the GOP proved yet again they do not care about the American people or their health care. Democrats brought Trump’s “fixer” to testify about the president’s immorality and criminal behavior in front of the entire country, including the surprising fact that Trump signed checks to Michael Cohen reimbursing him for the payoff to Stormy Daniels while sitting behind the Resolute Desk in the Oval Office. The response from the GOP? Crickets. This is what real oversight looks like. It’s what the Constitution requires. And it’s what Republicans failed to do for the first two years of the Trump administration. Democrats held the line on Donald Trump’s disastrous government shutdown and helped shine a spotlight on the plight of government workers and millions of others who were struggling to pay their bills, make their mortgage payments and feed their families as Trump forced them to go without paychecks for more than a month. We continue to learn of the disastrous impact on our country from Trump’s irresponsible and dangerous government shutdown, including an FAA unable to warn pilots in a timely manner of a software flaw in the auto-pilot system of the Boeing 737 Max 8. Trump put people in danger and harmed families in a reckless attempt to force Congress to give him money to build his vanity wall at the Southern border. We’ll share more key Democratic accomplishments tomorrow -- tune in.